Barkley’s Mom and my Mom spent the evening painting their favorite boys! Bright acrylic paints that Auntie Jane went crazy with! Too fun! These paints are forgiving and even Mom felt comfortable using them. She picked this picture of me experiencing my first snow storm. Yikes what a day that was! The theft of the rattle was disturbing. The only item stolen from the studio. Trying to distract herself from this mystery Mary Lou did some research on rattles. Discovered at archaeological sites throughout the world there was plenty to learn. Music, healing rituals, spiritual journeys, the supernatural, and simply a child’s toy. Ceremonial, sacred, magical, powerful, and simply soothing. Her dreams included the peaceful vibrations of the different rattles she had studied and now created in her dreams. Wooden rattles carved with love, gourds painted and decorated with leather and feathers, and the clay rattles of all shapes and engravings. Rattles filled with rocks, seeds, grains, shells and clay pellets. A sighing haaaa as her breath entered each rattle before it was sealed. This tube rattle had crossed over from her dream world. Almost alive it seemed to ache to be put to work. Most rattles had a noble job. She wondered at its purpose. A little sushi, ginger pickled beets and some sake. That would set her straight. After feeding her growling stomach, she felt the migraine melt away until it was just a regular pounding blinding headache. A second cup of sake and the headache diminished to a roar, she was at least able to think. This was not the first time Mary Lou had lost time working with clay. But even then, with time flying by, she was aware while working on a project. The total loss of time and memory had only happened once before and was also followed by the intense migraine. That project was again something she created from a dream. At first she was unable to figure out what it was. A square piece of pottery and the small pile of clay balls wrapped twice in delicate tissue paper. She was compelled that first time to blow gently into the square, her breath making a soft “haaaaaa” sound. Nine clay balls had been dropped into the square and with a second whispered “haaaaaa” she sealed the square. As she made several small holes to the bottom of the square it was then she realized what she had created. The impressions she made on that square rattle were done with a hard rubber stamp. A stamp she had never seen before and none of the other potters in the studio had either. When it came time to glaze the piece she was drawn to cooling and calming colors, shades of blue and green. The piece had disappeared one night from the studio. No other art had ever been taken before or since but May Lou was too relieved to have it gone to make an issue of the disappearance. It was what she has learned since that has made her creation of the new rattle comforting rather than alarming. She smiled again, a bonus was that she could now put off making that teapot for Dennis. This tube rattle had a sense of urgency that couldn’t be ignored. 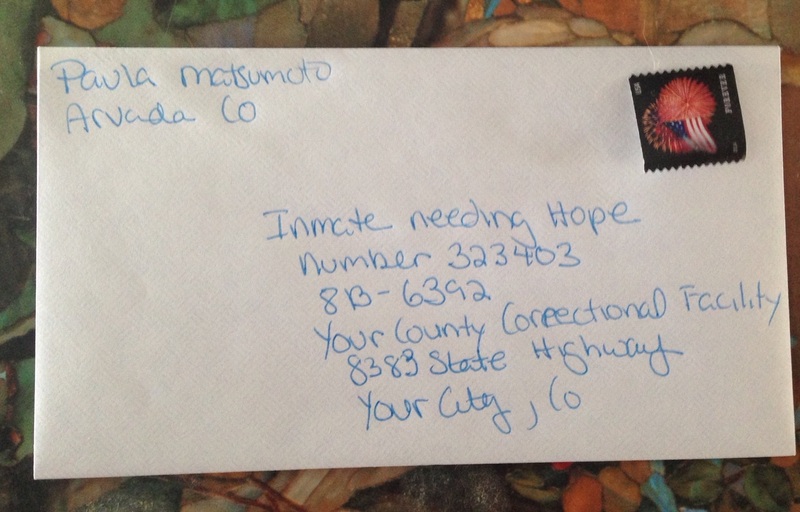 I am still writing to to my friend in prison. He is teaching me a lot about appreciating life, letting go of things I cannot change, and not forgetting things I am blessed with. In his own words he is afraid of forgetting things we take for granted each and every day such as the taste of certain foods, smells, and relationships. He has no choice of foods. He misses the smell of a forest. His incarceration has been hard on his relationships. He is afraid of losing what is the core of his essence, his tenderness, empathy and kindness. I continue to write to him, mostly about every day things, attempting to make him a part of my life. I would not have been brave enough to start sketching if I didn’t know him. He is the most talented artist I know and so I sometimes send him my sketches. He graciously compliments my efforts and tells me to keep working on my art. The thing I think he is worried most is his relationships, especially will we be here for him when he is released?